Bellevue Dentists at Brookside Dental in Bellevue, WA, have observed that periodontal disease, commonly called gum disease, can be a problem which can interfere with the creation of a beautiful smile. Cosmetic dentists in Bellevue, WA, have previously discussed that periodontal disease is a major smile enemy. People that have serious gum disease will need to have this problem corrected by their Bellevue Cosmetic Dentists before they can have any dentistry smile makeover work performed, such as that done with porcelain veneers. Once periodontal disease is corrected, your Bellevue Cosmetic Dentist will be able to create a beautiful smile using porcelain veneers or other cosmetic dentistry procedure. Additionally, Bellevue Dentists have noted that dentistry researchers have observed more serious health problems are thought to be associated with periodontal disease. There is information available at the American Academy of Peridontology about how gum disease is linked to heart disease and stroke. Multiple theories have been given to explain the link between periodontal disease and heart disease. A major theory is that oral bacteria can affect the heart adversely by entering the blood stream and subsequently contributing to clot formation. Coronary artery disease is characterized by thickening of the walls of the coronary arteries due to a buildup of fatty proteins–this is the area that the oral bacteria are thought to attach and grow contributing to the arterial thickening. These areas can form clots and restrict the flow of blood carrying oxygen and nutrients to the heart, which thereby causes the heart to malfunction and ultimately lead to heart attacks. Thickening of the arteries by such a process may also contribute to the cause of strokes. Another theory is that the bacteria cause inflammation in the thickened arteries, which is generated by the normal body defense against microorganisms. Excess inflammatory cells produced during inflammation can add to the thickened area, which can lead to a potential heart attack or stroke. Dentistry researchers have found that people with periodontal disease are nearly twice as likely to suffer from coronary artery disease and subsequent heart attacks as people that do not have periodontal disease. Periodontal disease also may exacerbate pre-existing heart conditions. Patients at risk for this type of problem may be required by their physician to be placed on antibiotics before any invasive dentistry procedures can be performed. Bellevue Dentists indicate that treatment of periodontal disease depends upon the stage of the disease and its progression. In the early stages, the disease is very treatable and even reversible. Your Bellevue Dentist or dental hygienist can usually clean your teeth to remove any plaque that has accumulated on the teeth. This process should leave the teeth relatively normal and requiring only regular periodic cleaning for maintenance. In more advanced disease stages, it may require scaling and root planning of the teeth to remove the plaque and the more difficult to remove tartar. This process is often referred to as PSRP (periodontal scaling and root planning). Medications may also be recommended to make sure that the bacteria levels do not build up in your mouth. Antibiotics may be applied directly to the cleaned and treated gums to help kill any residual bacteria that could cause disease. Today, lasers are used in modern periodontal therapy to gently and quickly kill bacteria, to remove any scar tissue that might be present in periodontal pockets, and to seal the affected areas as the laser passes through. Most patients are able to undergo laser treatment without any anesthesia. Additionally lasers promote the reattachment of gum tissue to teeth. In very severe cases where the gums have receded and the roots of the teeth are exposed, grafts from the roof of your mouth will have to be sutured into place to become new gums. This surgical grafting process is usually done by a dental specialist called a periodontist. Gum grafting can be avoided if the prevention methods listed above are used on a regular basis. 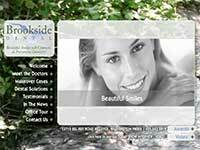 For additional information on periodontal disease contact your Bellevue Dentists, Dr. Brian Cave or Dr. Cynthia Pauley at https://www.brooksidedental.com.